This will be the sixth Air Festival since the airshows at Biggin Hill restarted in 2014 and retains the two-day format introduced in 2017. The first display to be announced is an impressive one. 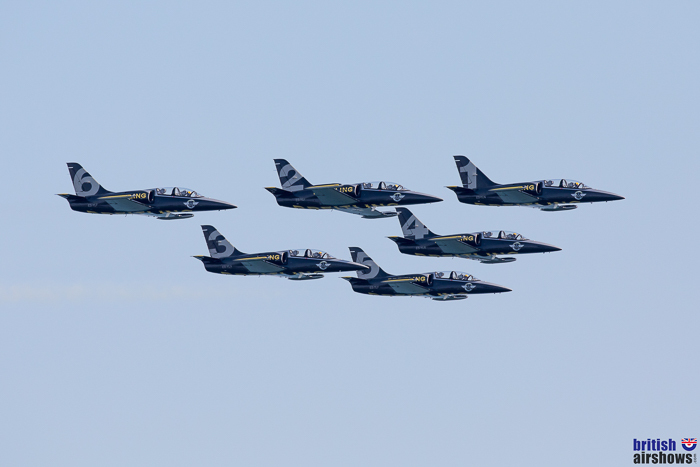 The Breitling Jet Team will return to Biggin Hill for the first time since 2006 after their impressive return to the UK skies at Bournemouth in 2018. 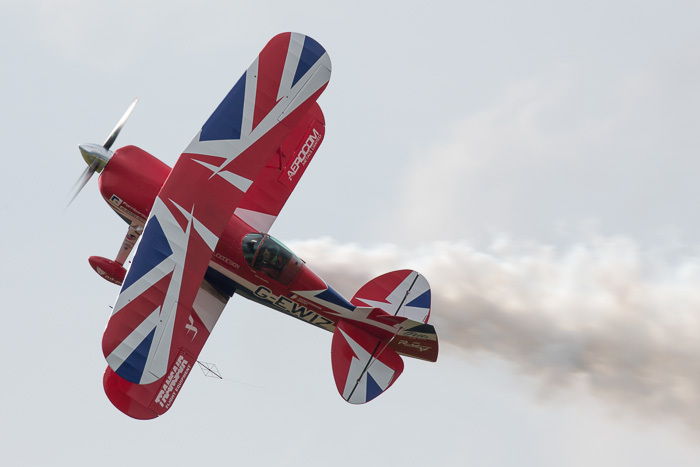 Mike Ling will also be back at Biggin Hill, this time not as Red 10 but as a pilot for The Blades who are due to fly at the show and the Royal Jordanian Falcons will fly their four Extra 330LX aircraft. Airshows at Biggin Hill were organised by Air Displays International until 2010. In 2011 there was an airshow said to 'better reflect the airport's 'emerging role as a Business & General Aviation Aerospace Centre', but with recognition of its past' with WW2 aircraft displays. A new sequence of annual airshows entitled the 'Biggin Hill Festival of Flight' began in 2014. Biggin Hill was a famous fighter station that played a major role in the Battle of Britain and, despite repeated attacks, remained operational throughout. On November 2nd, 1939, a squadron from Biggin Hill shot down the first enemy aircraft of WW2, a Dornier Do17. It is now an international airport and home to several warbirds owned and operated by the Biggin Hill Heritage Hangar, based at the airport. The fourth year of the show in its new guise was stretched to 2 days and celebrated the centenary of the airport. Since it restarted in its present form in 2014, the Festival has been rather fraught with problems, ranging from woefully inadequate toilet and refreshment facilities in the first year, terrible parking control for the first two years and bad luck with the weather. The infrastructure problems had been sorted by year three and the date change helped on the weather front, so 2017 was set to be the year when it all came right for Biggin Hill. Unfortunately, there were still some complaints about traffic management within the grounds, so possibly some more work to do there. Credit for the success of the show is down largely to foreign participation, which accounted for a third of all the displays. 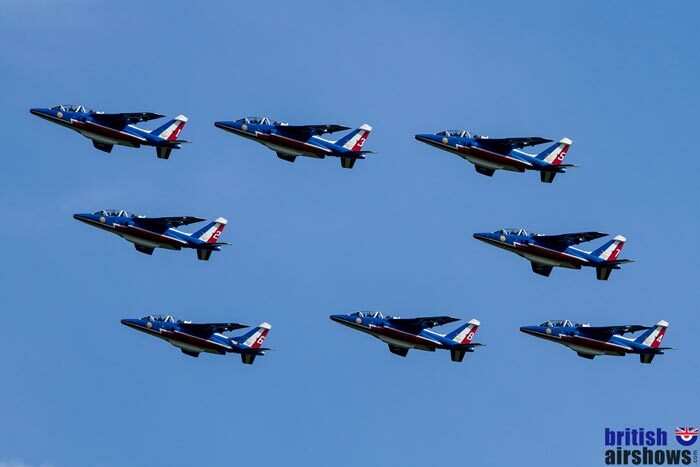 The Patrouille de France; the ever-popular display by the Belgian F-16 and the contributions from the Czechs set the show apart, not only from earlier shows at Biggin Hill, but from other aerodrome shows in 2017. The two-day August format is due to return in 2018. We are hoping the line-up will be just as good and management of the car park exit reverts to 2016 efficiency. Back for a third year in its new guise, there was around 4½ hours of flying during the rather drab and slightly damp afternoon at this year's Festival of Flight. This is a family show and featured plenty to delight the family audience, including the wingwalkers and turbulent display team, although there was little innovation or combination flying for the regular airshow-goer to enjoy. Thankfully, lots of the logistical problems suffered at the two previous shows had, at last, been sorted out, so getting in, leaving and making use of the toilet and refreshment facilities were all no worse than at most air shows - and better than many. The flying displays included the Red Arrows and a Spitfire and Hurricane from the BBMF, hot from the Queen's 90th birthday flypast, although the Lancaster, originally expected, was still unserviceable. The Apache Helicopter Display Team had been booked but support for the show was withdrawn by Joint Helicopter Command, so the Apache display had also been cancelled and the general weather situation between his base and the airfield prevented Terry Martin bringing his Westland Wasp. The main historic attractions were the Fairey Swordfish, Sally B, the Catalina and the Blenheim and this was also the first public outing Hangar 11's Mustang in its new 'Red Tails' livery. With the exception of Sally B, these aircraft also adorned the static line-up, where those who were not keen to sit on the flightline could see at reasonably close-quarters the planes crew, fire-up and manoeuvre, adding significantly to the spectacle. Among the civilian highlights were Richard Goodwin with his usual stonking performance, for those who stayed beyond the Red Arrows, and the Bronco, without the team's Skyvan. On the ground two Westland Gazelle helicopters from the Gazelle Squadron were the most popular of the static displays. The team allowed visitors to get up close and even sit in one of the Gazelles. There was also a massive funfair, children's amusements, meet the pilots and the usual trade stands. At many shows the VIP, sponsor, veteran, media and other enclosures consume so much of the crowdline that there is little left for the paying customer. A major plus for the Biggin Hill show is the generous access to the crowdline, with relatively few allocated enclosures: these at the end rather than the centre of the flightline, leaving the coveted central area for anyone who arrives early enough to base themselves there. Keeping everyone abreast of developments as they happened were commentators Andy Pawsey and Ben Dunnell, with the specialist commentators for some teams including Red 10 Mike Ling for the Red Arrows. Unfortunately the audience in the centre of the crowd line couldn't hear a word he said over a young band screeching into a rather better audio system on the main stage. Volume aside, the stage entertainment was popular and varied, with plenty to cheer the youngsters as well as the vintage ballads more common to airshows. The full flying list is in the table. Biggin Hill is on the A233 in Kent, quite close to Bromley. From most directions, take the M25 and exit at junction 4. Don't try junctions 5 or 6, even from the west, because of congestion on nearby roads. There are links to route planners in the Travel Advice column if you prefer to plan ahead or don't have sat nav. The show is well signposted and there are usually several routes into the airfield to split up the traffic queues. Traffic news is provided by the airshow radio - the frequency is signposted as you get close. National Express do not go direct to Biggin Hill, but they do have services from London to Sevenoaks, Coulsdon, Hooley and Wallington all about 6 - 7 miles away. There is also a service between Hooley and Brighton. Stagecoach and Metrobus have local bus connections to Biggin Hill from local towns, coach stations and train stations. There are details of local services here. The nearest station is Hayes, about 4 miles away. Click here to create a pocket timetable for your journey between any stations on the National Rail network. The variety of rail tickets and fares can be very confusing. Trainline and Raileasy web sites list all ticket and fare options for the time and day of travel you choose but they both levy an admin fee. Click either of the blue ticket agency names to go to their web site. It is best to book as far as possible in advance. This is not only because nearby hotels and guest houses tend get booked up well before the date of an airshow but also because prices can be better when you book early online. There are plenty of booking agencies. We find that many of the well known ones are better at finding hotels from international or larger UK chains and may suggest hotels in main towns or cities quite a distance from the show site. Expedia lists a good selection of smaller, as well as bigger, hotels and will find accommodation in villages and small towns as well as the main centres. They also give, and take, Nectar points. Click the blue Expedia name for a list of hotels and guest houses near the show. The venue is already built into the link, so when the list comes up you just have to adjust the dates, number of rooms and guests, as necessary. For no-frills hotels, the International Hotels Group have nearby a Holiday Inn Express about 9 miles away in Croydon ; there are five Premier Inn hotels within 10 miles of so of the airport. The Met office seven-day forecast includes maximum, minimum and "feels like" temperatures, the likelihood of rain, wind direction, gusts and visibility: the latter can have an impact on the viability of displays. The BBC's five-day forecast has overall conditions including temperatures, UV range and a description that may help to determine how pleasant the day will be for the visitor. Click the blue-text link to go to the forecast. The location is already built into the links. Tickets are now on sale. We do our best to get everything right but there may be errors and things may change. Please check with show organisers before making any commitments. If you know anything that we should add, correct or update do, please, let us know. Thank you. The 2019 calendar & map are online and will grow as more show dates are announced. The table attached to the airshow map starts in date order. You can reorder the table by clicking a column heading. Please use this contact form for any messages, comments or feedback. Thank you. Any messages using the contact form are sent to British Airshows, not to a specific airshow.